Di Blas, N. (2016). Distributed TPACK What kind of teachers does it work for?. 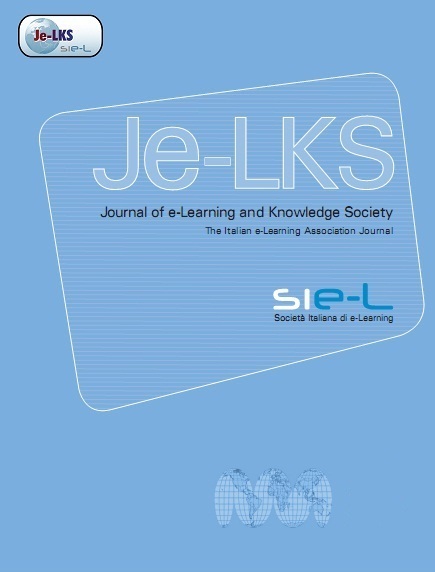 Journal of e-Learning and Knowledge Society, 12 (3),. Italian e-Learning Association. Retrieved April 20, 2019 from https://www.learntechlib.org/p/173479/. Angeli C. (2008), Distributed Cognition: A Framework for Understanding the Role of Technology in Teaching and Learning, Journal of Research on Technology in Education, 40 (3), 271-279. Di Blas N., Paolini P. (2013), Beyond the School’s Boundaries: PoliCultura, a LargeScale Digital Storytelling Initiative, Educational Technology& Society [Special issue], 16 (1), 15–27. Di Blas N., Paolini P., Sawaya S., Mishra P. (2014), Distributed TPACK: Going Beyond Knowledge in the Head, in: Searson M., Ochoa M. (eds), Proceedings of Society for Information Technology& Teacher Education International Conference 2014. 2464-2472, Chesapeake, VA, AACE. Hewitt J., Scardamalia M. (1998), Design principles for the support of distributed processes, Educational Psychology Review, 10 (1), 75-95. Hutchins E. (2001), Distributed cognition, in: Smelser N.J., Baltes, P.B. (eds), International encyclopedia of the social and behavioral sciences. 2068-2072, New York, Elsevier Science. Hutchins E. (1995), Cognition in the Wild, Cambridge and London, MIT Press. Karasavvidis I. (2002), Distributed cognition and educational practice, Journal of interactive learning research, 13 (1/2), 11–29. Kim B., Reeves T.C. (2007), Reframing research on learning with technology: in search of the meaning of cognitive tools, Instructional Science, 35 (3), 207–256. Koehler M.J., Mishra P. (2005), What happens when teachers design educational technology? The development of Technological Pedagogical Content Knowledge, Journal of Educational Computing Research, 32 (2), 131-152. Koehler M.J., Mishra P., Kereluik K., Shin T.S., Graham C.R. (2014), The Technological Pedagogical Content Knowledge Framework, in: Spector J.M., Merrill M.D., Elen J., Bishop M.J. (eds), Handbook of Research on Educational Communications and Technology. 101–111, New York, Springer. Koehler M.J., Mishra P., Yahya K. (2007), Tracing the development of teacher knowledge in a design seminar: Integrating content, pedagogy and technology, Computers& Education, 49(3), 740–762. Jones D., Heffernan A., Albion P. (2015), TPACK as shared practice: Toward a research agenda, in: Slykhuis D. Marks, G. (eds), Proceedings of Society for Information Technology& Teacher Education International Conference 2015. 3287-3294, Chesapeake, VA, Association for the Advancement of Computing in Education (AACE). Mishra P., Koehler M.J. (2006), Technological Pedagogical Content Knowledge: A framework for teacher knowledge, Teachers College Record, 108(6), 1017–1054. Pea R.D. (1993), Practices of distributed intelligence and designs for education, in: Salomon G. (ed) , Distributed cognitions: Psychological and educational considerations. 47–87, New York, Cambridge University Press. Phillips M. (2013), Investigating in-service teachers’ workplace TPACK development, Australian Educational Computing, 28(2). 1–10. Steketee C. (2006), Modelling ICT integration in teacher education courses using distributed cognition as a framework, Australasian Journal of Educational Technology 2006, 22(1), 126-144. Shulman L.S. (1986), Those who understand: Knowledge growth in teaching, Educational researcher, 4-14.